The nineteenth century was to prove a time of great change and development for England, and indeed the same can be said of Weddington Castle. On a national level the Victorian Age was characterised by rapid change and developments in nearly every sphere - from advances in medical, scientific and technological knowledge to changes in population growth and location. Over time, this rapid transformation deeply affected the country's mood: an age that began with a confidence and optimism leading to economic boom and prosperity eventually gave way to uncertainty and doubt regarding Britain's place in the world. Today we associate the nineteenth century with the Protestant work ethic, family values, religious observation and institutional faith. For the most part, nineteenth century families were large and patriarchal. They encouraged hard work, respectability, social deference and religious conformity. While this view of nineteenth century life was valid, it was increasingly challenged by contemporaries, with a marked emphasis on the wider role of women in society. Politics were important to the Victorians; they believed in the perfection of their evolved representative government, and in exporting it throughout the British Empire. This age saw the birth and spread of political movements, most notably socialism, liberalism and organised feminism. British Victorians were excited by geographical exploration, by the opening up of Africa and Asia to the West, yet were troubled by the intractable Irish situation and humiliated by the failures of the Boer War. At sea, British supremacy remained largely unchallenged throughout the century. During the Victorian heyday, work and play expanded dramatically. The national railway network stimulated travel and leisure opportunities for all, so that by the 1870s, visits to seaside resorts, race meetings and football matches could be enjoyed by many of this now largely urban society. Life for the residents of Weddington, as has been seen in earlier sections, had already been irrevocably transformed from the peasant existence of its earliest incarnation as ‘Watitune’. The migration of workers in previous centuries, coupled with the booming silk trade in Nuneaton (which saw an almost 50% population rise in the early 1800s) meant that living patterns were changing, although at this time almost all the population of Weddington were still engaged in agriculture, whilst others were servants (largely at Weddington Castle). The census of 1841 shows a total population of 77. With the collapse of the ribbon trade in the 1840s, local work patterns changed once again, with many workers migrating to the coal mines, brickyards and quarries. Coal had been mined locally since the fourteenth century, and by the 1860s and 1870s new mining techniques, together with the advent of the railways, boosted coal production in this area. This building of railways and roads generated the need for good stone, of which Nuneaton also had plenty. The town was also blessed with beds of the finest brick clay in the country. Entrepreneurs took over old brick kilns, modernised them, and created the opportunity for their products to be shipped countrywide. Indeed an old brick kiln is referred to in records of the 1840s, just along from Weddington Grove. Back at the start of the century however, developments at the Castle began in 1807 when its ownership was acquired by one Lionel Place, whose family originated from the Yorkshire area and were related to titled gentry. A report in December 1818 (when the Castle was offered sale for £30,000) reveals that Lionel Place paid £14,000 for the Castle and grounds and £12,000 for the surrounding farms. Lionel's investment in the Castle didn't end there however, and in 1809 he commissioned the well-known architect Robert Lugar to redesign the Castle, incorporating the old house and making it castellated. The Castle was transformed into a stone-faced building, possibly using Attleborough sandstone, of a similar nature to Arbury Hall. This transformation was achieved by encapsulating the Elizabethan Hall, which dated back to about 1600, within a decorative stone façade. The North and South Lodges may have been built at this time or modified from earlier buildings, and were designed in the Picturesque and Cottage Orne architectural styles which developed in the 1790s. The Castle grounds were also landscaped at this time, possibly by a disciple or assistant of Lancelot 'Capability' Brown and a map from 1811 shows ornamental lakes and a boating river course. "...the old front [was] altered by making an entrance porch and square tower, carried up to shorten the length of the roofs, and to give character with more accommodation. The south end, also, is carried up to obtain two family bed-rooms, as well as to give more feature. The subordinate buildings are chiefly conveniences to the kitchen: these, together with the gateway, which is the entrance to the stable court, are entirely new. The improvement of the grounds has been effected under Mr. Place's direction who has, by judiciously planting, removing hedges, and altering the roads, produced the most beneficial, as well as pleasing advantages to the demesne." 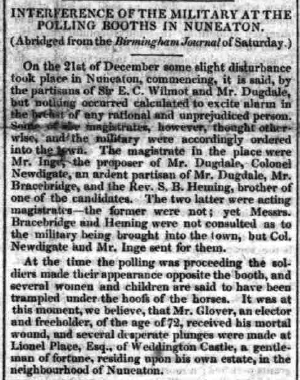 Subsequent to - and presumably as a result of - this meeting a bridge across the River Anker (Weddington Meadows Bridge) leading from the top of Abbey Street to Weddington was erected and ground raised at Lionel Place's expense on the 2nd January 1818. It was later this year that Place offered the Estate for £30,000, although in the event he only sold a 196 acre farm at Weddington for £13,000. Despite further run-ins with the court (most notably in October of 1818, when he "kicked the posterior of a labourer (Davis) with such force (and the man being ruptured) he was so affected that his life was for some time in imminent danger"), Lionel Place was elected Sheriff of Warwickshire in 1826; although he continued to make the news for more sensationalist reasons, as this item from the Leicester Chronicle of 1833 demonstrates! By 1826, gardening duties at the Castle were the responsibility of one William Seymour, who in a letter to "The Gardener's Magazine and Register of Rural & Domestic Improvement" dated January 21st 1826, describes himself as Gardener to Lionel Place, Esq., Weddington (click here to view a PDF of the letter). 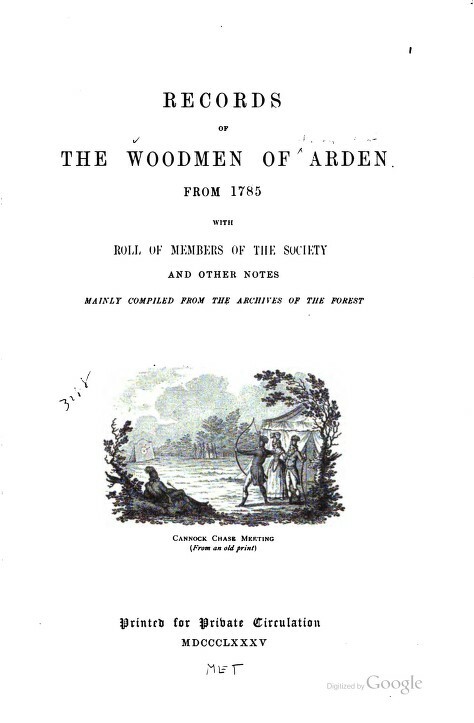 A 'Martin Leggatt' is also noted as being a resident of Weddington Hall in 1827 (according to the book: "Records of the Woodmen of Arden from 1785" which detailed members of the historic 'Woodmen of Arden' archery club, based at nearby Meriden). It appears that the Castle was offered for let several times around this time by his son William Henry Place (see this advertisement in the Leicester Journal - Friday 10 September 1830). Mr Place died, aged 72, in 1838 and was buried at St. James' Church, Weddington, with the estate passing to his wife, Sophie. For the next few years Isaac Swinnerton continued to develop the Grove, building a brick wall by the road side of Derby Lane (later to be known as Weddington Road) in 1836, and Weddington continued to expand. 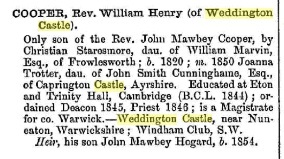 By 1841 the population was 77, living in 11 households, with records showing John Arnold as residing at the Lodge and a James Ward as being a servant at the Castle. A nearby isolated bungalow cottage, located by the old brick kiln along from the Grove, was inhabited by a Mr Woolley during the 1840s. We know from records that, on the 7th August 1843, an auction was held at the Castle by the auctioneers William Pullin at which furniture, library contents and paintings were sold off. The sale catalogue lists the sumptuous trappings of a very wealthy family, including several paintings by Turner, Moreland, Molinaer and Towns, as well as a well stocked library of 509 books and manuscripts and 129 antiquarian books printed before the first half of the 18th century. In 1845 Sophie Place was officially noted as land owner in the tithe apportionment for the Weddington estate although the actual succession of ownership and occupation of the Castle and Manor becomes rather complex from this point revolving largely around the Bracebridge, Hall, Heming and Kay families. 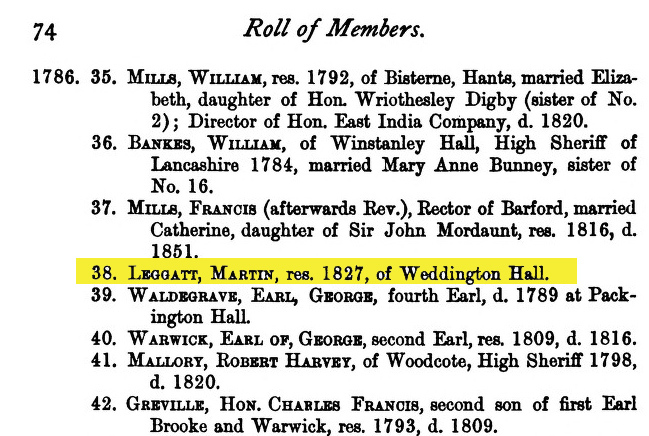 These associations in various ways served to engender close links between Lindley, Caldecote and Weddington, all of whom had impressive Halls at the time. In 1845 the New Incumbent was named as the Reverend S.B. Henry; and John Atkin, Joseph Robottom and Robert Swinnerton are recorded as farming the area. It appears that the Castle and grounds of 62 acres was once again offered for sale in 1851, you can read the notice of sale here (2nd column along). Details were available from Mr Henry Dewes, solicitor, presumably the same person who later made repairs to the Castle. Robert Swinnerton is recorded as living at the Grove at this time. In 1857 the Place family papers are recorded as containing a dated parchment instructing that Weddington Castle and Estate be disposed of. The situation of Sophie Place is unclear here, although there is no doubt that this sale signified the end of an era for the Castle. That same year Isaac Swinnerton died aged 85, and was buried at St. James' Church. The Castle was then bought by Henry Kay, although William Cooper from Peckleton in Leicestershire (described in 1861 as a 'Clerk Without Care Of Souls', and in 1865 as a 'Clerk Without Lands') continued to live there. Despite effectively being a tenant, it appears from the 1861 census that Mr. Cooper kept a full household staff befitting such an establishment: including a nurse, 2 laundry maids, 2 housemaids, a ladysmaid, a kitchenmaid, a footman, 2 gardeners and a coachman. Full details of the Castle's inhabitants from the 1861 census can be found here. The Catalogue of the auction where Mr Kay bought the Castle can be viewed here. The owner, Mr. Kay, was a cotton and silk merchant from Manchester. Records of 1861 detail a rise in the Weddington population to 74 (from an ebb of 51 ten years previous), this is possibly due to the earlier demise of the silk trade, following by the boom in mining and quarrying in the area. In 1865, Henry Kay died at the age of 65 and was buried at St. James' Church. In 1866 the Castle passed to Henry's son, Frederick Henry Jewell Kay, who was 21 at the time, whilst Henry's widow, Elizabeth Kay continued to live at the Castle until her death, aged 61, in 1871. When Mr. Kay junior married the next year the marriage was said to be the biggest event in Nuneaton for many years with the streets festooned with flags, evergreens, buntings and triumphal arches. It seems Mr Kay also made extensive additions to the Castle during his ownership: you can read a brief local press account of a dinner to thank the workmen here from 1870. Sadly, records appear to show that Frederick's wife died in childbirth (the premature son, also, was stillborn) in 1874**. Henry Cunliffe Shawe was active in the local community and in 1865, he inserted three windows in the nave of St. James' Church. He also paid for reconstruction work on the church in 1881. A new organ was installed in 1882, and the following year a stained glass window inserted as a memorial to two of Mr. Shawe’s children. 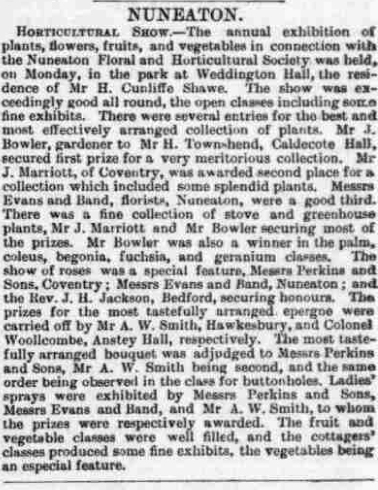 During both Mr. Kay and Mr. Shawe’s ownership the Castle and its pleasure gardens were well known for local fetes and garden parties, such as this horicultural event reported in the Leamington Spa Courier - Saturday 27 July 1889. 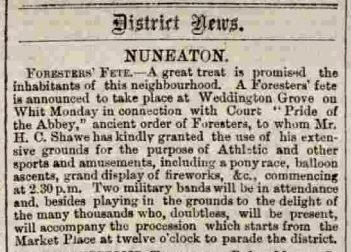 The Weddington Grove grounds were also home to local fetes courtesy of H. C. Shawe, for instance the Forester's Fete - you can read a contemporary account of this event from the Tamworth Herald in 1876 here. The influence of the Shawe’s can still be seen today, and one of the principal roads of Weddington is named ‘Shawe Avenue’ (and indeed the first house in this avenue has the original crest from the Castle incorporated into its frontage to this day). Shawe was married to Georgina Wilmot Shawe - the daughter of Sir William Nigel Gresley, of Netherseal Hall, Leicestershire - and had two sons (Henry Nigel Pole Shawe and Charles Shawe, an army captain) and two daughters - Edith Mary Shawe (who married Colonel Francis Capel Manley) and Eleanor Grace Shawe (who married Lt. Colonel Egerton Stanley Pipe Wolferston of the 1st Battalion, S. Staffs Regiment). In 1889 Henry Shawe added Lower Farm to the Estate, purchasing it from Ebenezer Brown for £3,900. In 1891 a census was carried out which showed the Weddington population as 100 (up from 81 the previous decade). Inhabitants detailed include Henry Cunliffe Shawe at the Castle, Alfred French at the Grove, Charles Pendry at Gardener's Cottage, Henry Badger at the Lodge and David Blythe at the Wardens. In 1901's census, we see that there were eight servants at the Castle, including a butler, Robert Thompson. The Grove boasted eight servants also, along with its own butler, Peter Fleming. * picture above is of the Nuneaton Market Place in 1881 taken from 'The Graphic Illustrated' of the same year. ** "Bedworth Guardian & Warks Miners' Saturday Evening Journal 1874" entry dated 19/12/1874. *** additional information on Reverend William Cooper provided by Reverend Sonia Marshall, Curate, Deeping St James Priory Church. March 2017.